A tradition in Japan and Hawaii every Friday and Saturday, July 16 – August 28. 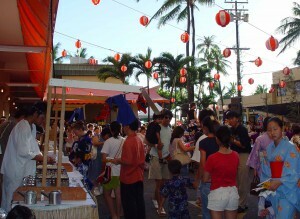 Come and enjoy the summer season with the Natsu Matsuri (Summer Festival) at the Pacific Beach Hotel every Friday and Saturday evening across from Waikiki Beach from July 16 through August 28, 2010. The Japanese celebration will feature food, children’s games, entertainment and traditional bon dancing and music. Everyone is invited with no admission. Festivities begin at 5:30 p.m. with yatai (food booth) and yomise (games & toys) available to guests, kama‘aina and visitors. Every evening will feature the showcasing of local bon dance groups at 6:30 p.m. and guests are invited to join the circle of bon dance. Traditional Japanese dishes will be sold including okonomiyaki (Japanese savory pancakes), yakisoba (fried noodles) and cold udon noodles. 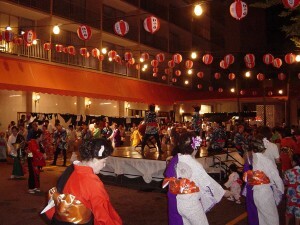 For more information on the Natsu Matsuri, please visit the Pacific Beach Hotel’s website at www.pacificbeachhotel.com or call 944-3041. For information, visit the Pacific Beach Hotel’s website at www.pacificbeachhotel.com.